Gothenburg was still getting better at hosting Melodifestivalen and this time they really made a mark on the competition as they decided to enlarge the final and present twelve songs instead of ten. A real success story. I'll state it at once: this is the strongest lineup ever in a final fully produced by SVT Göteborg (discounting 1975 with was a stellar year but masterminded by Stockholm). Unfortunately the show in itself wasn't as glorious as the songs in competition. Gothenburg television had for many years relied heavily on their star Fredrik Belfrage - who was now hosting for the third time - and he felt tired and not really engaged. No wonder as he had already hosted several hours of morning television that very same day. Luckily the show turned into a real nail biting finish as Lotta Engberg and Arja Saijonmaa fought it out to the bitter end. To the very bitter end, apparently. Years later, Arja still talked about the disappointment at losing. Most of the 1980's national finals have this surprising moment when you really must ask yourself what the selection jury was thinking when they decided to include a certain song. In 1987, this is the one. Pathetic lyrics about a refugee fleeing violence and death before ultimately feeling joyful about being sent back to "his people". Drivel. The boys are back following their commercial success of last year. This song is a lot less anthem-esque and far more straightforward pop but also pretty flat and repetitive and went nowhere. Pretty much like the career of Baden Baden after this participation. Despite successful entries in both 1984 and 1985, Göran Folkestad's singing career never really took off and now he contented himself with being just the composer. His chosen performer was a scoop - a young piano player who was the New Hot Thing and who had recently been elected Sweden's sexiest man. Somehow he and the song never really gel - would Göran Folkestad have sung it better himself? - and this relative failure kept haunting Robert Wells for years until he reinvented himself with the Rhapsody in Rock concept. Style was performing a difficult balancing act between making chart-friendly pop while being a well-groomed Svensktoppen act. This effort falls somewhere in between the two fields and is arguably better than their 1986 effort without feeling particularly important. Made the super final on old merits alone. Just like the Robert Wells-case, it seems Anna and her song are oddly mismatched. The song isn't bad and the lyrics are pretty good but don't seem credible coming from a performer this young (and - in all fairness - this limited). Soon after the final, CBS terminated Anna's record deal. 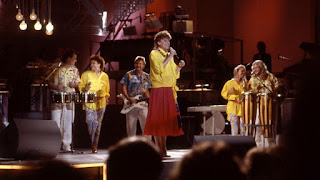 An aggressively cheerful and jaunty dansbandschlager that probably was less aimed at winning and more had the objective of reviving Paul's career which had been non-existing since his 1980 entry Tusen sekunder. If so, the trick worked and gave him a few more songs on Svensktoppen. Why the technicians decided to more or less eliminate his duet partner from the sound mix remains a bit of a mystery but the whole thing is effective enough. Another song that felt perfect back then but failed to stand the test of time. Skara goes Tropical and all the fruits are made of plastic. Two lasting things came out of this song, though. Lotta Engberg was launched into a stardom that lasts to this day and the problem with song title including two registered trademarks led to SVT slowly beginning to revise its outdated rule book. Annica was another one of those talented singers floating around at the Mariann label without ever getting a real breakthrough. This is a quality schlager with elegant verses, a slick chorus and an almost parodically perfect key change. A powerful ballad of a kind seldom heard before in a melodifestival. The meeting between a well-crafted song (penned by Bobby Ljunggren, Håkan Almqvist and Ingela "Pling" Forsman who would continue working successfully together for many years to come) and gospel singer Peters added gravity and depth to the final. Beautiful. Sound of Music was about to fall apart later that very year but their final participation was excellent proof that you can be jaunty, cheerful AND contemporary at the same time. The lyrics, celebrating friendship between girls, also makes a welcome exception from all the songs about love and falls perfectly into the line of Nanne's later output. We all thought we knew where we had Arja - Finland's most famous export to Sweden - when she suddenly made a record for the Mariann label together with Lasse Holm and made a surprise appearance in Melodifestivalen. This ridiculously effective stomper - making full use of Arja's dramatic Finnish accent - left Sweden craving for more and made sure Arja would never be forgotten. For the second year running, Lena was criminally overlooked by the juries. Wasn't she modest enough? She wrote her own songs, made her own clothes, demanded the right to do things her own way. Was that annoying for a segment of the audience? Just like her 1986 entry, "Dansa i neon" found eternal life as a pop evergreen that will remain for many years still. For the second year running the juries failed to channel the public opinion in general and left Sweden with a winner that was good but no complete favourite. This was the last time that the jury was organised into age groups instead of having regional juries around the countries, maybe that's where the syntax error was to be found? Lotta only made it to 12th place in Brussels. My bet is that Lena, Arja or Sound of Music all would have had a reasonable shot at making the top five. Given that a ballad won the international final, maybe also Cyndee could have touched a few buttons around the continent. Arja Saijonmaa is the great diva of whatif's in Finnish-Swedish Eurovision history. I remember the excitement in Finland when we learned that our own Arja Saijonmaa was near winning the Swedish selection. Her entry was played in the Finnish selection show and after that year YLE tried several times to get her to take part in the Finnish selection. In 1988 she said no to a very Lasse Holmish entry (written in swedish) "Svart och vitt", which finally was sung capably by Helena Miller and which lost with one point (can't you see the irony) to "Nauravat silmät muistetaan". With Arja as a singer that song would have won for sure. Two years later Arja finally said yes and came third in the Finnish final with "Gabriela" which was an ok song by Petri Laaksonen (composer of Sata Salamaa and Eläköön Elämä) but not as effective as Svart och vitt would have been with Arja Saijonmaa at the helm. Thank you, Tobias, for keeping me away from watching all of the news last weekend, while instead reading all of your great Melfest posts of the good old 80's days. It got me back to normal life for a few hours and gave me a spark of hope in these sad and crazy days after the European 9/11 in Paris! 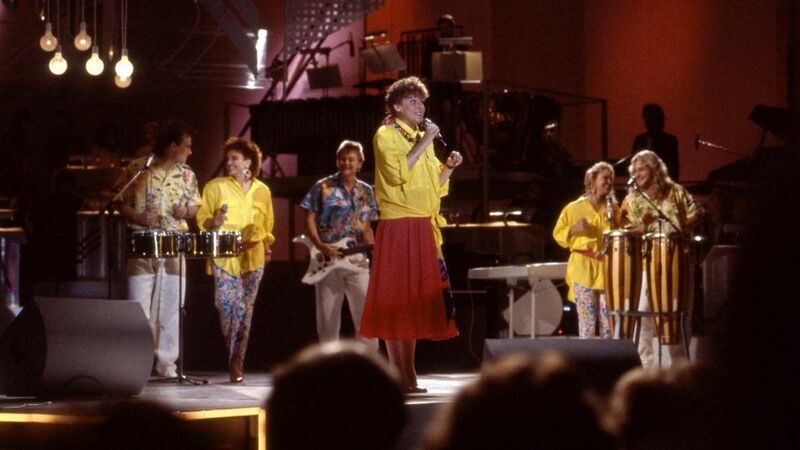 I share your view that 'Dansa i neon' by Lena Philipsson was (by far) the best song in the line-up of 1987. And it is still one of my favourite songs over all Melodifestivalen years. I will never get how the Swedish public/jury could go for that Carnival Schlager by Lotta Engberg as their ESC entry that year?! Thanks for this great series of Melfest posts that I enjoyed reading very much, especially last weekend! ESC 2016: A 7th victory for Sweden?